They got a few collections of photos and factoids about Kamalhaasan. (read on a comment on Lazygeek). This Kavidhai from Mr. Kamal is a real food for thought. Dont you think. I always think parenting is the most critical job. There used to be a Quote "Tell me who your friend is.. I will tell you who you are..". Similarly I think this way. "Tell me who your parents are, and I shall tell you, why you failed". Dont want to trouble you much on a monday morning, but give the Kavidhai a deep read, and think about it. If you are going to be a parent, and you want your son/daughter to succeed.. it purely depends on how you will act and react. Just dont do too much of anything. I've showcased my "So-called-stories" on a separate page. Please visit "avyuktaSLB.blogspot.com" and read them with Ultimate patience. Trust me its not worth it, but if you have even unworthy time... Give this a shot. Please feedback. 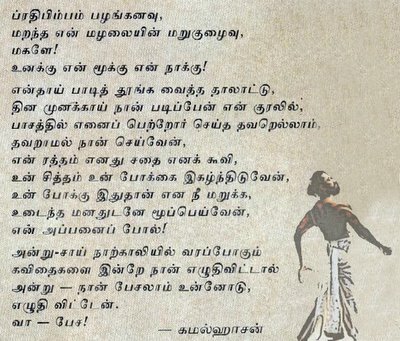 kamal's poems often have a cetain style, and hint of upper handedness in his poems. His urge to show his multi-talents are often potrayed in his poems, especially with the use of words that are not in daily use. He often tries to break the conventions of poetry.. this looks more like a prose to me. 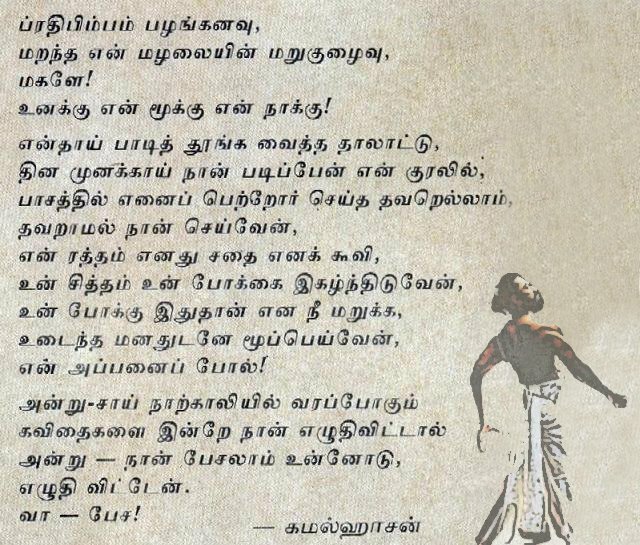 I wish the makers of "Thavamai Thavamirundhu" read this! About parenting, one of my relative commented recently, 'ippallaam romba dhaan panra pa, kozhandha, kozhandhannu! 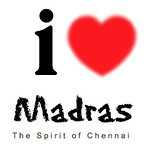 Andha kaalathule saaptiya, thoonginiyannu kooda kettadhille'!! prabhu, personal touchnaala , its more special. revathi, most of the Pudhukkavidhai specialists try using uncommon words. thats ok..
uma, good luck to your son !! God given right ?? Vaazga Valamudan !! aparna, beetiful. This comment from your relative is really practical. Nice photoshopping work with the Poem. I saw the thing at the universalhero site. Your Hey Ram Kamal imprint is a touch of class and genius. It looks great and echoes the sentiments of the poems. venkat, thanks a lot for the appreciation. I think you are the only one who noticed. Im happy you did. Thanks for blogrolling.